Today the mall in Washington, D.C. is being trampled by those who say there is no God. Below is a news article from Fox News. Atheists and other nonbelievers are gathering Saturday on the National Mall for what organizers say may be the largest secular gathering in Washington’s history. Thousands of atheists, humanists and others are expected to gather for the “Reason Rally,” featuring speakers, music and comedy. Organizers say they also expect to be challenged by religious groups. The National Park Service says a permit calls for an estimated crowd of 15,000. The American Humanist Society is one of the primary sponsors. Roy Speckhardt, the group’s executive director, says the rally will be a “coming out party” for humanists and atheists and a rally for political change. There are just a couple of things that I would like to point out, and then I am done. First, 15,000? Are you kidding? I am not a Joel Osteen fan by any means, but he has at least twice that many in his congregation on any given Sunday! And these people say they speak for the majority of Americans? Get real! Secondly, I couldn’t help but think of all the monuments surrounding the National Mall. 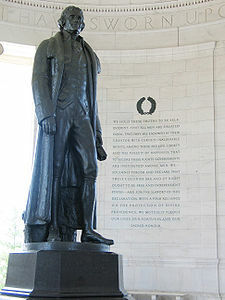 One in particular is worth noting: The Jefferson Memorial. One of key speakers at the Reason Rally will be Prof. Richard Dawkins. Speaking of this event, Dawkins says that our country is “constantly under threat from people who would like to turn this country into some sort of a theocracy” (see story below). However, one would think that if America should have ever become a theocracy, it should have been early on, when our founding fathers were not afraid to speak of He from whom our liberties are granted. So, while they march, while they sing, and while they laugh, God’s name surrounds them, engraved in stone, while His eye beholds their acts of reason. I would encourage you to listen to all four parts of the following address by Dr. Ravi Zacharias. Tagged as faith, God, Jefferson Memorial, march, National Mall, National Park Service, protest, Ravi Zacharias, Thomas Jefferson, United States, Washington, Washington D.C.